← Start of something awesome? Gameday Update: Here comes Alfredsson! Babcock confirms that Daniel Alfredsson will be back in the lineup, tonight, after missing 6 games with lower back spasms. The wings will definitely welcome his leadership and offensive ability. Babs is excited to get him back. So are we, Mike. Alfredsson has gone 3 practices real hard and hasn’t had any issues so he looks to be good to go. With Alfie taking that spot on the third line, Bertuzzi will join Samuelsson and Kindl as healthy scratches and Gustavsson is back in net, according to Babcock. 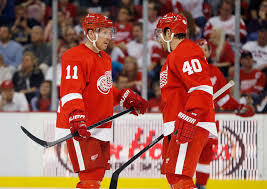 The kid line of Jurco, Sheahan and Tatar remain together after having a very good showing against Chicago. Seems Jurco has earned himself some extra time with Detroit.